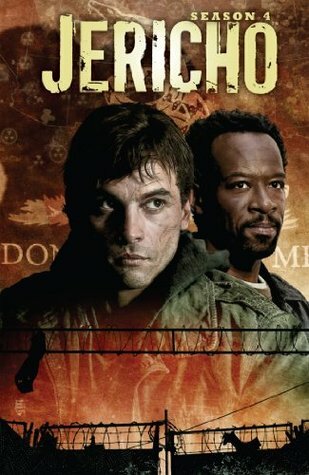 For those unlucky enough not to be familiar with it, Jericho is the 2006-2008 television show about the aftermath of a nuclear event in the United States and its effect on a group of people in a small Kansas town. Season Four begins with Jake Green and Robert Hawkins returning to Jericho, for which both are extremely happy. But things in the outside world are anything but peaceful. The country itself is neatly split into two rival camps by the Mississippi River; the eastern section of the country calling itself the USA, while the western states are now called the Allied States of America. While separate nations, both the USA and ASA have the same problems: food is scarce, relief aid is sporadic, lawlessness is epidemic, a plague has begun to spread, and a war with the other is looming. So while our two heroes have succeeded in their mission from Season Three, they find themselves trapped into a political plot that could reveal the villains behind the September nuclear bombings, topple a government, start a revolution, and get everyone they care about killed! Like the previous comic collection, Jericho: Season Four is plotted by the creative team behind the television series. This consistence in writing remains the strong point of this collection, as the story continues without any deviation from the previous plot lines with all the familiar characters included in the goings-on in Jericho. And while the tone of the story changes a bit, it is still 100% Jericho with several lingering mysteries beginning to be answered. There were a couple of problems with this collection, however. One, the artwork was not a strong point. One issue would be great, and then the next would feature a different artist who might not live up to the high stands this series has exhibited in the past. In fact, there were a few times in the story where the heads of the characters appeared to be “photoshopped” onto a body. Something that did not work at all and really ruined the whole visual presentation. Lucky, though, these problems were sporadic enough not to derail the story. Two, the story was slow. There are lots of conversations between characters, lots of plotting what to do next, but not much action. Not that dialogue is a bad thing, mind you, but here the talking seemed to be setting up plots for future stories rather than tying into what was currently going on. With those criticism outlined, however, a Jericho story with problems is better than no Jericho story at all, so I’d encourage any fan of the show to pick this one up. And for those unfamiliar with the show, get on Netflix and try it out! Buy Jericho: Season 4 at Amazon. This entry was posted in 5 Stars, Graphic Novels, Jericho, Post-apocalyptic and tagged best post apocalyptic stories, Jericho, Jericho: Season Four, post-apocalyptic graphic novels, post-apocalyptic television series, Robert Hawkins returning to Jericho. Bookmark the permalink. CBS wanted Jericho to be a post-apocalyptic Mayberry RFD and that is why the pace was slow for the first 10 episodes. After the winter hiatus (2006/2007), the writers were allowed to write the story they wanted. That is why the pace picks up later in the season. I spoke to the publisher at WonderCon 2014 and we have been promised that only one artist will be used for the season 5 comics. All issues will be done before publication, so we won’t have to wait long between issues. I hope is a real artist, because that photoshot thing with the faces of thecharacters just is so bad and ugly.